(Nanowerk News) Metallic glasses -- alloys lacking the crystalline structure normally found in metals -- are an exciting research target for tantalizing applications, including artificial joints and other medical implant devices. However, the difficulties associated with predicting how much energy these materials release when they fracture is slowing down development of metallic glass-based products. 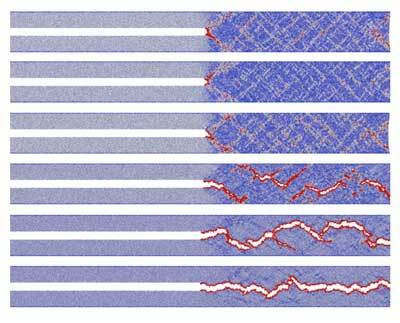 Recently, a pair of researchers from Rensselaer Polytechnic Institute in Troy, New York, developed a new way of simulating to the atomic level how metallic glasses behave as they fracture. This new modeling technique could improve computer-aided materials design and help researchers determine the properties of metallic glasses. The duo reports their findings in the Journal of Applied Physics ("On measuring the fracture energy of model metallic glasses"). Fracture energy is a fundamental property of any material. It describes the total energy released -- per unit area -- of newly created fracture surfaces in a solid. “Knowing this value is important for understanding how a material will behave in extreme conditions and can better predict how any material will fail,” said Binghui Deng, another author on the paper. “Computer-aided materials design has played a significant role in manufacturing and it is destined to play far greater roles in the future,” Shi said.